Respected or loathed, William W. Lear exhibited memorable contrasts throughout his life that changed from time to time between being regarded as a first-rate officer or a deplorable villain. To some he was courageous, a resourceful officer in combat, and tenacious; his family and closest friends attested to his tenderness and care. To others, he had a treacherous temper, exhibited ruthless tyranny, and was a coldblooded killer. This man with an ambiguous personality managed to eclipse all of his unsavory character flaws and past misdeeds when he fell in General Zachary Taylor’s assault on Monterrey in September 1846, celebrated from that point forward as a hero, rather than as a rogue. Though his exact birthdate is a mystery (likely the 1790s), William W. Lear was born in Harford County, Maryland. The Marylander first entered the army when he enlisted as a private with the U.S. Light Dragoons in May 1812. He rose to the rank of corporal and then to sergeant during his service in the War of 1812. Lear received an appointment as a second lieutenant in the Fourth Infantry Regiment by the order of President James Monroe in February 1818. He would remain in this unit for the next twenty-four years of his life. Only eleven days later, he received promotion to first lieutenant. He joined up with the Fourth Regiment just in time to take part in Andrew Jackson’s incursion into Florida against the Seminoles, followed by the subsequent occupation of Spanish-held Pensacola in May 1818. Another incident showcasing Lear excessive enforcement of discipline surfaced not even a month later in September 1818. He ordered Private Charles Mason – described as a “great drunkard” – to be “ducked” following a night of drunken debauchery. After being placed in the stocks overnight to sober up, Sergeant Lewis Starks and a few soldiers took Mason to the harbor of Pensacola, under Lear’s orders, where the adaptation of the medieval form of torture was “carried out to such excess” that it killed him. Although Lear was placed under arrest, Colonel King ruled that he could not be held accountable for Mason’s death, and released him without trial or a legal investigation. Lear miraculously escaped both incidents with his reputation intact (Colonel King would shoulder much of this blame). Three years later, in a similar fashion to Sam Houston’s 1832 public thrashing of William Stanbery of Ohio, Lear waylaid a victim while stationed in Pensacola. Observing the “abominable act” from across the street, Henry Brackenridge gazed in horror from the window of his office as Lear savagely laid one strike after the next with a cowskin on the head of Washington Lee Hannum, the magistrate of West Florida (the reason for this attack is still a mystery). After the incident was broken up, Colonel Duncan Clinch posted a guard to Lear’s quarters to provide protection from the fearful and infuriated citizens of the city (he appeared capable of handling his own affairs). Despite this damning episode and receiving a rebuke from Andrew Jackson, Lear was made a captain on 1 May 1824 (and later a brevet major). No charges were ever pressed and he escaped with his reputation intact. This period of mourning was interrupted when Lear was again under fire for his conduct while in Baton Rouge in 1839. “A rumor was in circulation” that he had been an accessory to the mutilation of a man by the name of Lee. On Saturday morning, 19 January 1839, he voluntarily turned himself in when he “heard with astonishment and mortification” the rumors of his involvement in this heinous crime. The Adjunct General of the United States, Roger Jones, had recently ordered Lear to join his regiment without delay with forty-three new recruits, but he decided to remain in the city, “until this stain was removed.” Bail was set at $1,000, which “was at once furnished,” and Lear’s friend and lawyer, Robert Nash Ogden, agreed to represent him at trial. The trial commenced on Wednesday evening of 30 January, 1839, the courtroom “crowded almost to suffocation.” A number of witnesses were called forward to give their appraisal of Lear’s character, “all of whom, without exception, acquitted Major Lear of the slightest participation in the act, or countenance of it.” The same account recorded that many of these witnesses, “testified to the kindness, generosity, and humility of his disposition, and that act of which he was accused was utterly inconsistent with the whole tenor of his conduct and with his well know character.” Ogden’s elegant closing argument softened the jurors, generating empathy by commemorating Lear’s long residence in the city, “his irreproachable and honorable conduct,” and the heartbreak he suffered over the loss of his two daughters. The jury rendered the verdict without even leaving the box and he was acquitted of all charges. On 14 June, 1842, Lear was promoted to a full major in the Third Infantry, succeeding Major Henry Wilson. In the spring of 1844, the entire regiment was transferred to Camp Wilkins, Louisiana. During the summer of 1845, the regiment moved to Corpus Christi, Texas, where it arrived in the early part of August on the eve of war. The Third Infantry fought with distinction in Zachary Taylor’s Army of Occupation at the Battles of Palo Alto and Resaca de la Palma on May 8 and 9. The regiment fought under the command of New York Captain Lewis N. Morris, grandson of one of the signers of the Declaration of Independence and West Point graduate. At some point before the regiment departed, Lear went on sick furlough attributed to “severe and repeated attacks of Asthma” which he had been suffering for the last two or three years. As the senior ranking officer on the field, he would have superseded Morris in command at these two battles, but instead missed both engagements. As soon as he caught wind of these battles he hastened to join the regiment in Mexico despite his fragile health. Lear arrived to Taylor’s camp outside the city of Matamoras, traversing 500 miles in six days. The asthmatic Major Lear “for whose safety fears were entertained,” traveled alone and successfully reached Zachary Taylor’s command without incident. One newspaper indicated that, “from his known impaired constitution, it is not probable he will be able to continue with the army long,” misjudging the dogged character of this old army officer. Lear immediately assumed command of the Third Infantry from Captain Morris on May 17. Never before had he commanded so many men at one time. He must have felt out of place being encircled by well-educated West Point graduates serving as his junior officers. He immediately enforced a strict policy of not allowing his officers to leave camp. Tragically, he would only remain in the most important command of his life for another sixteen weeks. As part of Lt. Colonel John Garland’s Third Brigade, Lear and the men of the Third Infantry departed Taylor’s base at Camargo on August 31. Their objective would be the Mexican stronghold at Monterrey, located 125 miles away. The sweltering 100 degree temperatures and the choking dust made the march to Monterrey unbearable for the American soldiers. Brevet Major Philip N. Barbour of the Third Infantry noted in his diary that, “Garland and Lear had a row,” insinuating the short-tempered Lear exchanged harsh words with his brigade commander during the journey. The extreme heat and exhausting journey must have made Lear’s asthma intolerable and his temper even more unpredictable, likely triggering symptoms of coughing, wheezing, or discomfort of the chest. 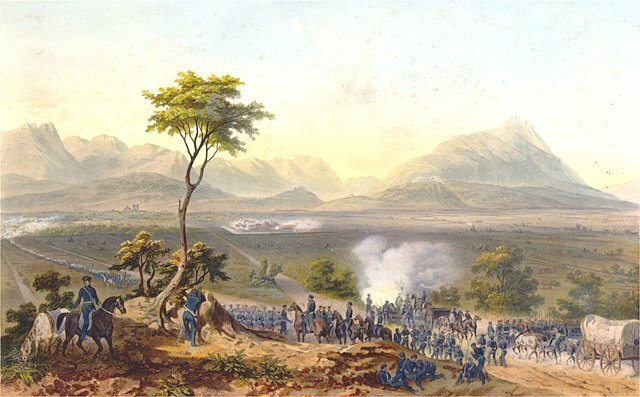 Taylor’s army arrived to the outskirts of Monterrey on September 19 and initiated the assault two days later. Lear’s Third Regiment played a vital role in the hectic street fighting that attempted to root out the Mexican defenders sheltered in the city. Lear came directly under fire while making an examination of a Mexican barricade down one corridor hindering the American advance. Returning back towards his regiment, Lear passed by Captain Electus Backus of the First Infantry Regiment, who shouted to him, “Major, with two or three companies of your Regt., I think we can carry that ‘work.’” Lear shot back, “No – we are in a tight place, and the sooner we get out of it, the better,” reasoning to Backus that they first needed reinforcements from Taylor. Only seconds after this brief exchange, a Mexican bullet zipped down the street and smashed into Lear’s face. He immediately crumbled to the ground. Backus ordered a few captured Mexican soldiers, under guard by a handful of his own soldiers, to lift the lifeless major into a blanket and transport him to the rear. The major was practically unrecognizable with his mangled face smeared with blood. In the end, General Taylor successfully captured the city, but at the loss of six officers and roughly one-third of the Third Regiment engaged as casualties. Jarvis gave an excellent but gruesome description of Lear’s awful wound and his misery over the subsequent weeks. He noted that the bullet had cut through Lear’s face above his upper lip, tearing away the upper maxilla and malar bone on the left side, exiting behind his ear. The muscles within his mouth and throat were horribly mangled or torn away altogether, and the teeth on the left side of his mouth were shattered. For several days, “pieces of bone were being constantly separated and discharged.” Unable to talk or swallow, Jarvis did the best he could to ease Lear’s agony, who further suffered from “intense inflammation” on the left side of his head. Somehow Lear hung on in this pathetic condition for five weeks, “which time he suffered exceedingly,” a testament to his gritty character. He finally succumbed to his injuries on October 30 around 12:00 p.m. He was buried the next day at 4:00 p.m. in a makeshift cemetery near Taylor’s camp at Walnut Springs, escorted by four companies of the Fourth Infantry under the command of Major Robert C. Buchanan and trailed by men of his regiment. A sketch of the cemetery where Lear was buried. 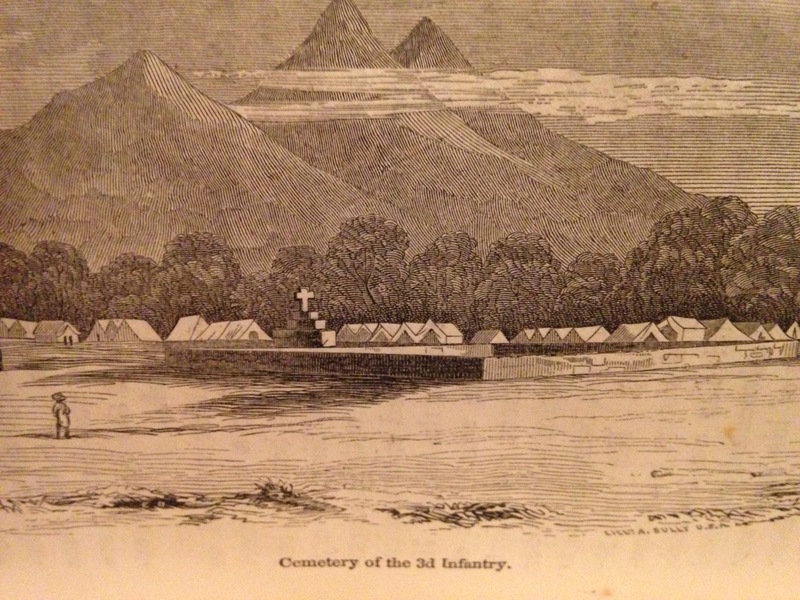 Image from “Campaign Sketches of the War With Mexico” by Captain William S. Henry (1847). It becomes my melancholy duty to report the decease of Major W.W. Lear, 3d. Infantry. The wound received by the lamented major in the action of the 21st of September, though very severe, was doing well, and hopes were entertained of his recovery; but his feeble system could not recover from the consequent exhaustion, and he sunk gradually until 31st October, when death put a period to his sufferings. I enclose a copy of the order announcing to the army the decease of this gallant and meritorious officer. 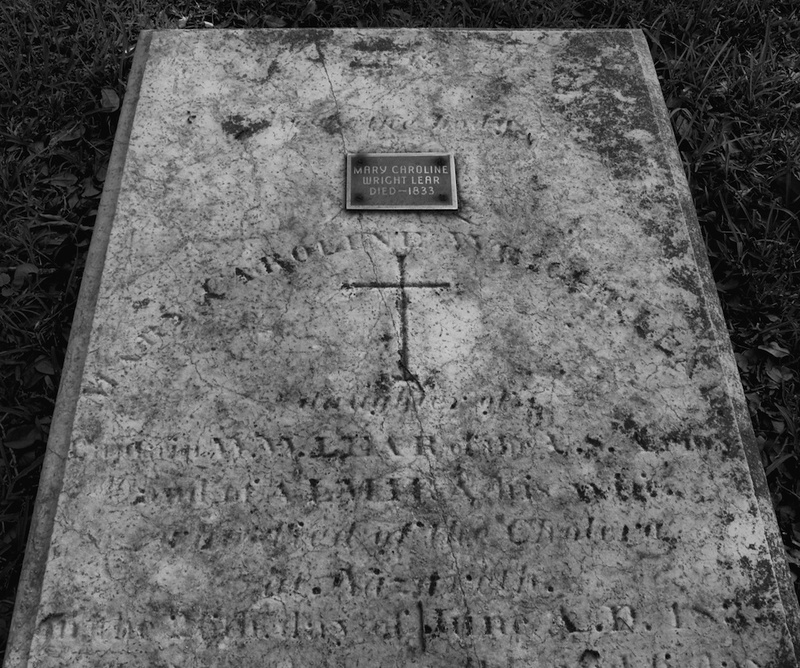 The original cemetery near Taylor’s camp has passed into oblivion, as have the bones and the memory of this mercurial army officer. Lear’s martyrdom permitted him to wash away the recollection of his misdoings and disreputable conduct in a number of instances. He likewise challenged Thayer’s ideology that army officers must be respectful and act as “gentlemen,” gaining glory and commendation even with his controversial behavior. Whether identifying him as a capable officer or as a rogue, it cannot be disputed that he overcame daunting physical ailments to fulfill his duty and died valiantly for his country, granting him the right to honored for his service. American Republican and Baltimore Daily Clipper. November 11, 1846. American Republican and Baltimore Daily Clipper. October 29, 1846. Backus, Electus. “A Brief Sketch of the Battle of Monterey; With Details of That Portion of It, Which Took Place at the Eastern Extremity of the City.” Historical Magazine 10 (1866): 207-13. Barbour, Philip N. Journals of the Late Brevet Major Philip Norbourne Barbour, Edited by Rhoda van Bibber Tanner Doubleday. New York: G.P. Putnam’s Sons, 1936. Baton Rouge Weekly Comet. October 29, 1854. Dana, Napoleon J. T. Monterrey Is Ours: Mexican War Letters of Lieutenant Dana, 1845-1847, Edited by Robert H. Ferrell. Lexington: University of Kentucky Press, 1990. Dilworth, Rankin. The March to Monterrey: The Diary of Lt. Rankin Dilworth, U.S. Army: A Narrative of Troop Movements and Observations on Daily Life with General Zachary Taylor’s Army During the Invasion of Mexico, Edited by Lawrence R. Clayton and Joseph E. Chance. El Paso: Texas Western Press, 1996. Henry, William Seaton. Campaign Sketches of the War with Mexico. New York: Harper & Brothers, Publishers, 1847. Henshaw, John C. Recollections of the War with Mexico, Edited by Gary F. Kurutz. Columbia: University of Missouri Press, 2008. Hseih, Wayne Wei-Siang. West Pointers and the Civil War: The Old Army in War and Peace. Chapel Hill: University of North Carolina Press, 2009. Jarvis, Nathan. “Jarvis’ Surgical Cases at Monterey.” In The New York Journal of Medicine, and the Collateral Sciences, Volume 8, edited by Charles A. Lee, 154-155. New York: J. & H.G. Langley, 1847. Journal of the Executive Proceedings of the Senate of the United States of the United States of America, Volume 3. Washington: Duff Green, 1828. King, William. Letters to James Monroe: President of the United States, from William King, Late Colonel of the United State Army. 1820. Marine, William M. The British Invasion of Maryland, 1812-1815. Baltimore: Society of the War of 1812 in Maryland, 1913. Messages of the President of the United States, with the Correspondence, Therewith Communicated Therewith Communicated, Between the Secretary of War and Other Officers of the Government on the Subject of the Mexican War. Washington: Wendell and Van Benthuysen, Printers, 1848. Nathan Jarvis Letters, 1833-1852. The New York Academy of Medicine, Library. “Naval Operations on the Mexican Coast.” Niles’ National Register. May-July 1846. NNR 70.240. http://www.history.vt.edu/MxAmWar/Newspapers/Niles/Nilesb1846MayJuly.htm. Notes from Yvonne Lewis Day of the Louisiana Genealogical and Historical Society. Richmond Enquirer. November, 27 1846. Schantz, Mark S. Awaiting the Heavenly Country: The Civil War and America’s Culture of Death. Ithaca, NY: Cornell University Press, 2008. Smith, George Winston and Charles Judah, eds. Chronicles of the Gringos: The U.S. Army in the Mexican War, 1846-1848, Accounts of Eyewitnesses and Combatants. Albuquerque: University of New Mexico Press, 1968. The Army and Navy Chronicle, Volume 8, January 1, to June 30, 1839. Washington City: B. Homans, 1839. The Evansville Journal. December 3, 1846. The New York Herald. November 26, 1846. The Somerset Herald and Farmers’ and Mechanics’ Register. Nov 10, 1846. Thorpe, Thomas B. Our Army at Monterey. Philadelphia: Carey and Hart, 1847. Webster, Lucien Bonaparte, and Frances Webster. The Websters: Letters of an American Army Family in Peace and War, 1836-1853, Edited by Van R. Baker. Kent: Kent State University Press, 2000. This entry was posted in Leadership--Federal, Mexican War and tagged army officer, bad temper, forts, march to monterrey, Mexican-American War, Nathan Jarvis, Ulysses S. Grant, violence, william lear, yellow fever. Bookmark the permalink.